Düsseldorf, 12 June 2018 – LOESCHE GmbH is a medium-sized, internationally active company that last year celebrated the 111th anniversary of its founding. In 111 years of the company's history, the name LOESCHE has always been associated with a great innovative capability that has significantly contributed to the success of the company worldwide. For decades LOESCHE has stood in particular for epoch-making developments in mill technology, which recently has also been signified by the phrase “GRINDING EXPERT” in the traditional LOESCHE theme. According to the demands of the market, LOESCHE is increasingly enhancing this still important field by developing complete processes. Providing complete solutions is becoming an ever larger part of LOESCHE's portfolio, which is also made clear in the new LOESCHE theme. “INNOVATIVE ENGINEERING” – this means much more than simply machine development. LOESCHE technology is traditionally found in the cement industry, steel industry, power plant construction, ore industry and minerals industry. In some of these fields LOESCHE is the global market leader. In particular, since the introduction of the patented M + S roller technology in 1992/1993, the number of granulated blast furnace slag and cement mills sold has increased, even exceeding the 400 grinding units sold recently. team, which uses this test center for the practical implementation of creative ideas. This research team processes complex tasks by combining profound knowledge of machine and process technology and extensive competence in the field of materials. One outstanding process development that LOESCHE has initiated and that has been processed in close cooperation with the F. A. Finger-Institut für Baustoffkunde (FIB) at Bauhaus- Universität Weimar is the thermally reductive modification of steel slags for recycling iron and manufacturing “steelworks clinker”. The results achieved by LOESCHE and the FIB impressively reinforce the great success of this approach. In contrast to the granulated blast furnace slag, original steel slag shows no appreciable binding behaviour after normal finish grinding. That is why the resulting slags in Germany have not been used previously in cement, but instead are used in road construction in unbound base layers or even in bituminousbound base and cover layers. A significant portion must also be deposited. 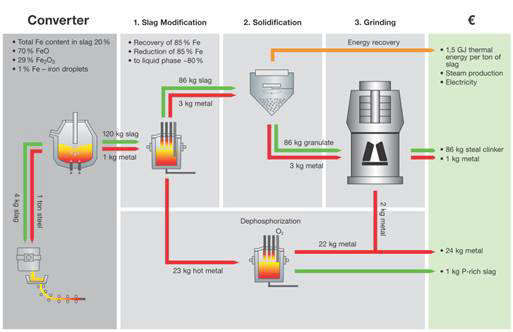 Against the backdrop of the preservation of resources, the current debate regarding reducing CO2 and LOESCHE's experiences of being able to recycle higher metal contents from a siliceous matrix, a new research began to produce an innovative conditioning process for steel slags. The hydraulic mineral binder manufactured on the basis of this procedure can be used as a composite material for cement or as an independent clinker material in accordance with the experience of LOESCHE. Two procedures for conditioning have been registered for a patent, which largely differ in the respective cooling process for the remaining molten metal. The first procedure provides for slow cooling over more than 15 minutes, which can be implemented primarily as passive, dormant cooling. A second conditioning process is based on fast cooling through additional measures in less than 15 minutes. The basic structure of the procedure can be taken from the following diagram. 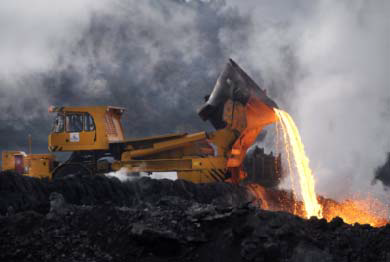 The mass flows are related to 1 t of poured steel slag. The individual stages of the procedure have already been tried and tested on an industrial scale. LOESCHE's partner for the entire procedure is the company Primetals Technologies/Linz, Austria, which has industrial-scale plants for reduction and fast cooling based on patented procedures in its product range. The remaining iron (approx. 8 – 10 %) that is still in the “steelwork clinker” can be separated in a LOESCHE mill. The separation procedure for this, which has also been patented by LOESCHE, has been successfully in operation for approx. 6 years to recycle stainless steel from stainless steel slags in a recycling plant in Belgium. To verify the idea envisaged by LOESCHE back in 2009 of thermally reductive treatment of LD slags, smelting trials with test material from a German steel works in the arc furnace of the Bundesanstalt für Materialforschung und -prüfung (BAM – German Federal Office for Material Research and Testing) were ordered in 2011 by LOESCHE/FIB. All chemical and mineralogical tests were carried out at the FIB in Weimar, which also managed the further development of the procedure in terms of materials. LOESCHE has made international patent applications for the two procedures for conditioning steelwork slags and for the formation of a hydraulic mineral binder with fast and slow cooling. These two conditioning procedures have already led to national patents in some cases. conditioning procedures for more than three years. The legal dispute was conclusively decided in December 2017 in front of the Munich Oberlandesgericht (Higher Regional Court). That decision confirmed that the second conditioning procedure – the fast cooling – was the sole property of LOESCHE. In relation to the first conditioning procedure – slow cooling – a third of the ownership was conceded to the BAM, represented by the Federal Republic of Germany. After the end of the legal dispute with the Federal Republic of Germany, the activities relating to the implementation of the two procedures on an industrial scale could be resumed by LOESCHE. Here the second procedure is considered by LOESCHE to be more economical, since the fast cooling can be carried out in facilities, in which heat recovery is also possible. In the coming years the aim will be to successfully implement the procedure into industrial practice. Innovations of this kind not only lead to high-quality use of a secondary material that has previously barely been suitable for any use, but also ensure LOESCHE's international competitiveness and thus jobs in German medium-sized companies.